Thinking of getting a Waterloo office fit-out for your office space in the Waterloo area? Have you finalized a neat commercial office design for which you require office fit outs Waterloo? Then, for any type of office fit out services, you should reach out to the experts at Sequence Communications and Electrical. To begin with, are you really aware of the many advantages of going for planned, designed office fit outs Waterloo? To make office interiors completely functional, office fit outs are the answer. Office fit outs clearly help divide and segregate the different sections or departments within an office setup. At times, you can also go in for office partitions Waterloo which helps optimize space to its fullest. 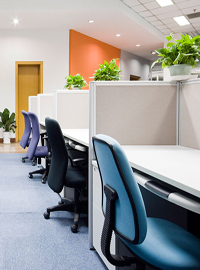 Office fit outs and office partitions are temporary structures and therefore, it is easy to install, uninstall and even repair, if required. Office fit outs come in different materials, colours and makes and they definitely gives a neat, complete look to the workplace. Office fit outs are economical and cost-effective, as compared to erecting actual brick and mortar walls. "If you have any queries about office fit outs or our electrical services, call, Sequence Communications and Electrical at 0418 139 999 or (02) 9913 9999 or email us at peter@sequence.net.au."